A cemetery was formed in 1878 and placed under the control of a nine-member Burial Board. Richard CROFT has a photograph of the Sutterton cemetery on Geo-graph, taken in February, 2008. The parish was in the Kirton sub-district of the Boston Registration District. We have a partial extract of the 1891 Census for the parish. You can also perform a more selective search for churches in the Sutterton area or see them printed on a map. The Anglican parish church is dedicated to Saint Mary the Blessed Virgin. The church was founded in the 11th or 12th century. The church tower was rebuilt in 1787. The church itself was thoroughly restored in 1903-8. The church seats 450 people. 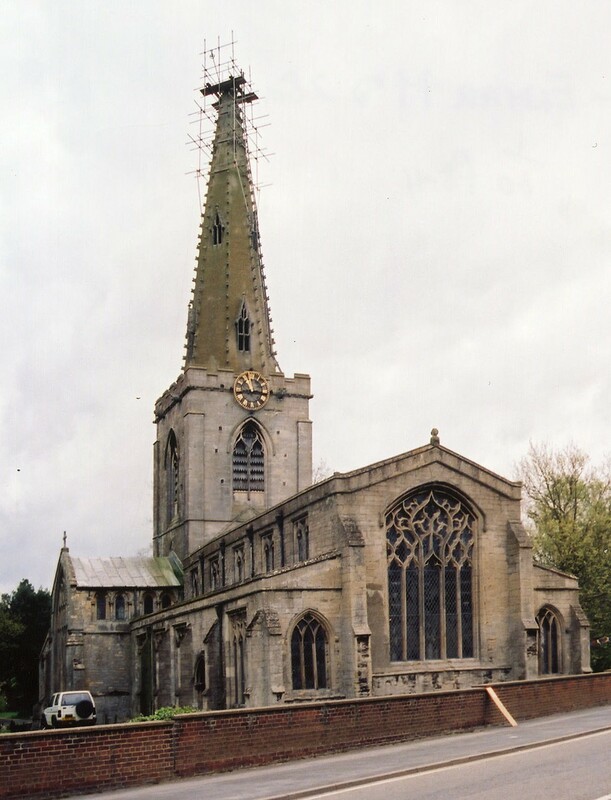 Geoff PICK has a photograph of St. Mary's Church on Geo-graph, taken in May, 2004. The Anglican parish register dates from 1538 for baptisms and burials, from 1539 for marriages. The LFHS has published several indexes for the Holland West Deanery to make your search easier. We have a fragmentary parish register extract in a text file. Your additions and corrections are welcome. The LDS Family History Library has the Parish Register, baptisms, marriages & burials 1538-1924, on film #0989865. The LDS Family History Library has the Bishop's Transcipt, baptisms, marriages & burials 1813-1830, on film #0508052 Item 5. The LDS Family History Library has the churchwardens accounts, marriages & burials 1754-1949, on film #0094066. The Baptists had a chapel here, built in 1803 and rebuilt in 1826. There was also a Wesleyan Methodist chapel built in 1839 and a United Free Methodist chapel erected in 1854. For information and assistance in researching these chapels, see our non-conformist religions page. Sutterton is both a village and a parish in the south of Lincolnshire, on the old road between Spalding and Boston. The parish is about 6 miles south of Boston and covers about 3,000 acres. Wigtoft parish is to the west, with Algarkirk parish to the east. The parish includes the hamlets of Struggs Hill and Dow Dyke. By automobile, take the A16 trunk road north out of Spalding or south out of Boston. Where the A17 intersects, about 6 miles south of Boston, turn north-east for about 1 mile. The village is bisected by the B1397 secondary road. Richard HUMPHREY has a photograph of the Water Tower on Geo-graph, taken in January, 2015. The Water Tower is a good landmark while walking about the village. Check our Touring page for additional resources. Ask for a calculation of the distance from Sutterton to another place. You can see the administrative areas in which Sutterton has been placed at times in the past. Select one to see a link to a map of that particular area. Richard CROFT has a photograph of the Beridge Arms on Geo-graph, taken in August, 2009. Dowdyke Hall was owned by Arthur John THRONHILL in 1912. A trace of World War II remains! Here is a photograph of a 3-Bay Pill Box left over from the conflict. A portion of the Sutterton War Memorial can be seen at the Photo Reflect site. The parish was in the ancient Kirton Wapentake in the Boston Borough in the parts of Holland. In 1840, the parish covered 6,550 acres. That was reduced by half by 1900. In 1880, the parish gave up almost 3,000 acres to help form the new Amber Hill Civil Parish. The Common Lands were enclosed here under the Parishes Inclosure Act of 1772. As a result of the 1834 Poor Law Amendment Act, this parish became part of the Boston Poorlaw Union. A National School was established here in 1825. A Public Elementary School was built here in 1865 and enlarged in 1894 to hold 145 children.